We, at BB Crafts manufacture, export, and supply a broad range of Metallic Thread Mesh Wrap developed from 100 % pure polyester. These thread mesh wraps specially woven by our trained professionals that use modernized machines and cutting-edge tools. Mesh wrap provides a grace and strong support to your floral arrangements and plant- focused craft projects. This light weight and soft touch metallic thread mesh ribbons and available size - 21 Inch x 6 Yards. The shiny and bright look of this mesh wrap are significantly used to make a deco mesh garland, floral arrangement, decorate Christmas trees, wreaths, bows, wrapping favors & gifts. It is also used to create a beautiful accent for your wedding, party, Easter or another special event. Our excellent quality thread cherished for its high strength and softness. 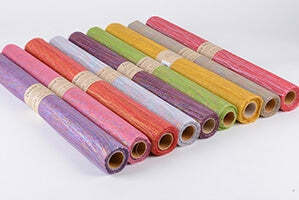 Our floral mesh wrap comes in a wide variety of colors and also in a metallic stripe pattern that can catch the light and allow your floral creations to shine. Besides, we assure to deliver this thread at pocket-friendly prices within the specified time frame.